So the Sighthill stone circle is on the move, evicted from its current parkland location with spectacular views over Glasgow, to who knows where? Despite Glasgow being unsuccessful in securing the 2018 Youth Olympics, Glasgow City Council is making good on its promise to rebuild Sighthill regardless of the result of this bidding process, and at some point in the near future, the stones will be plucked from the earth (actually, forcibly removed from their concrete foundations), and plunged into an uncertain future. Despite over 5000 signatures being added to a petition to save the circle and the monument even having its own benefit gig in Glasgow over the summer, by the end of 2013, this stone circle may well no longer exist in its current form. In this post, I want to focus not so much on the sense of loss and dismay felt by many people about this development (circle creator Duncan Lunan recently said he was ‘gutted’), but about the potential future of this monument, constructed just 35 years ago. In his book The stones and the stars, Lunan sets out in great detail the logistical and financial problems met in trying to build a modern-day stone circle. But behind all of the weirdness, and the helicopter, and the quarry in Kilsyth and the myriad council schemes and departments that contributed to its construction (most notably the Glasgow Parks Department Astronomy Project) lay a simple plan: to construct a stone circle that was astronomically aligned for the location it was established within, to act as a tool to help explain the movements of the sun, moon and stars to the people of Glasgow. This was not a monument that was built to teach the people about the Neolithic, but it was an explicit attempt to prove that stone circles could have been used astronomically in prehistory. This was not experimental archaeology, but rather speculative astronomy. This bold aspiration reminded me of something: an entirely modern stone circle built primarily as an astronomical tool, a teaching aid for the general public, planned by a small group of individuals with a passion for astronomy. But this stone circle is in New Zealand – Stonehenge Aotearoa. This strange monument is based very closely on the ‘original’ Stonehenge complete with trilithons and assorted additional monoliths. It was constructed by the Pheonix Astronomical Society with a grant of £19,000 from the Royal Society of New Zealand and opened in 2005 at Carterton, a few hours drive north of Wellington. The monument was constructed by the Society to capture public imagination and engage them in astronomy (not archaeology or European prehistory). The Society argue ‘many people are put of astronomy because they think it will be too difficult to understand. Stone circles, on the other hand, fascinate and entice a wide range of people’ (Stonehenge Aotearoa The complete guide). The slightly weird implication of this sentiment is that stone circles are easier to understand than astronomy, which I am not sure is the case…. The circle was painstakingly constructed using thousands of hours of observations and the labour of 150 volunteers. The monument looks like it is built from concrete, and consists of 24 uprights, with a continuous lintel connecting them; the whole monument is 30m in diameter, and 4m high. Various other standing stones have also been erected within and outwith the circle, such as a central tall obelisk. Each element of the monument draws attention to, and marks, alignments with the sun, moon and stars, and some help explain Moari and Polynesian stories. There are of course striking parallels with Sighthill. Both monuments draw on the rich and colourful history of archaeoastronomy, from the Stonehenge mythos of Gerard Hawkins to the explicit memorialising of four Scots archaeoastronomers at Sighthill. The monuments were constructed by astronomical ‘organisations’, in part drawing on grants, donations, string-pulling, volunteer assistance and very skilled and passionate team members. And both have a concern with encouraging interest in astronomy and widening access to a larger proportion of the public than would normally experience such things. Both are an amalgam of actual prehistoric monuments, either in the proportions or arrangements of stones. Both are teaching aids with visual tricks built in. A statement on the website for Stonehenge Aotearoa stresses that it ‘is not a replica. It is a complete and working structure designed and built for its precise location in the Wairarapa region of New Zealand’. Duncan Lunan could probably support an equivalent statement for his stone circle and Sighthill. But there are major differences. 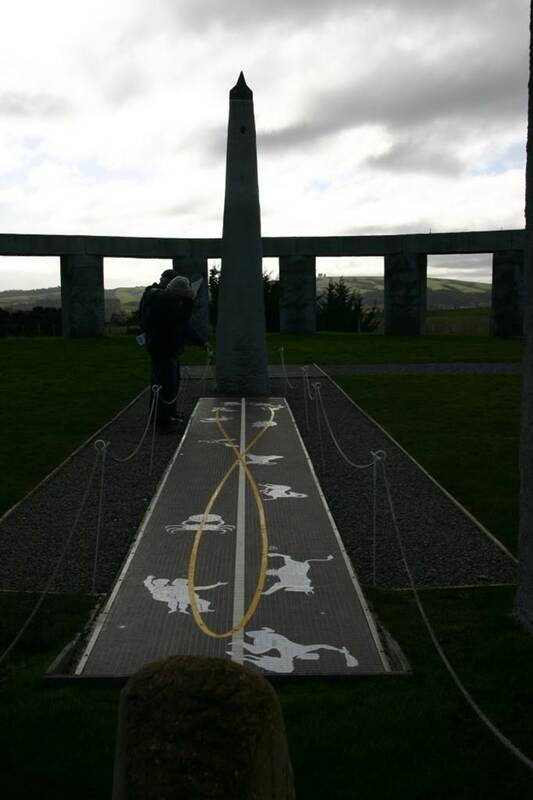 Stonehenge Aotearoa attracts big visitor numbers, and is well advertised and signposted. Stonehenge Aotearoa has an online shop. You can hire Stonehenge Aotearoa for weddings, birthday parties and other occasions. It is even being expanded, with additional standing stones planned. In other words, Stonehenge Aotearoa is going nowhere. Unlike Sighthill’ stone circle which will soon be on the move. 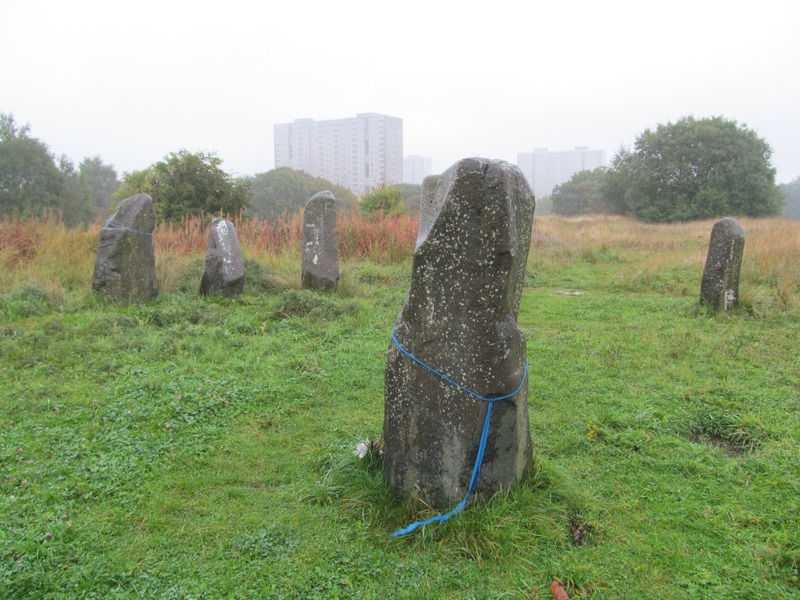 The aspiration to move the stone circle is of course better than the stone circle being destroyed entirely, but given the original function of the Sighthill monument, moving it will have a fundamental impact on the meaning and nature of the monument. This will be the case even if the stones are set back into the ground in exactly the same arrangement as they have just now, right down to millimetre precision. This is because the Sighthill stone circle can only work as originally intended in one place in the whole world: the place where it currently stands. The circle is a unique combination of stones, horizon, sun, moon and some stars, and altering any one of those factors will change the way the circle can be used and what it might mean. Changes have been made already: Lunan notes in his book that the demolition of some large buildings since the circle was constructed have increased the efficacy of appreciating some alignments built into the circle. But moving the circle would create an altogether different monument: it would be a stone circle but not the same stone circle. This begs the question: what is more significant to the meaning of a stone circle – the materials it is made from (the standing stones), the arrangement of those materials in relation to one another, or the place upon which it sits? This is more often than not an academic and abstract question, as stone circles do not often move, but when they do, problems are created and can persist. Perhaps the best example of this phenomenon in Scotland is Balbirnie stone circle (NO20SE 4) in the New Town of Glenrothes in Fife, which was moved and then rebuilt as an exact replica of itself in the early 1970s. It now has a questionable status. Part of a wider complex of Neolithic and Bronze Age monuments in a suburb of the ever-expanding Glenrothes in the decades after its establishment (close to Balfarg henge, perhaps the classic urban prehistoric monument in Britain), Balbirnie stone circle came under threat in 1969 with the proposed expansion of the A92. This road was to run through the location of the stone circle. Meetings on- and off-site were held between the Department of the Environment and Glenrothes Development Corporation (GDC). 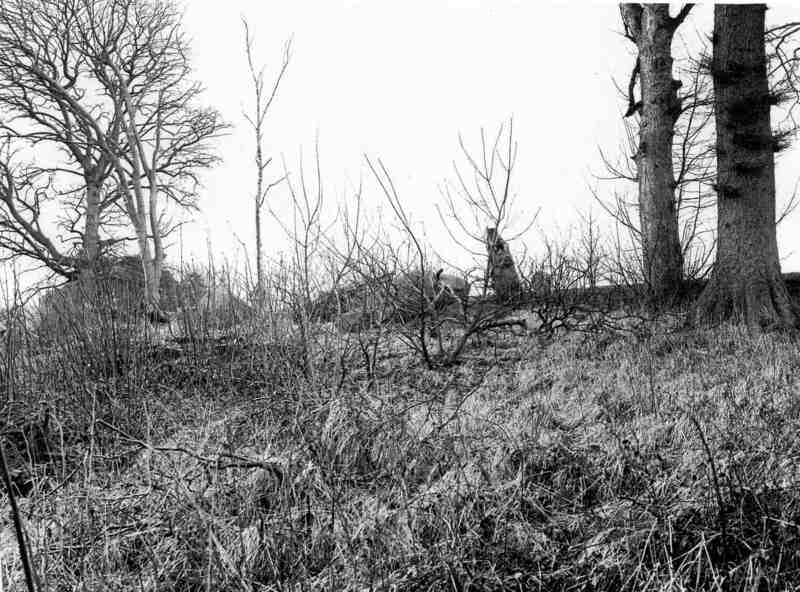 Archaeologist Graham Ritchie, who carried out the subsequent excavation of the stone circle in 1970-71, has recounted how the two sides disagreed. The government agency wanted to build the road and retrieve as much information from the circle as possible before its dismantlement; the GDC wanted the circle to be retained. In the end, it was decided that the circle should be fully excavated, and then moved to a nearby location (less than 100m from where it has originally stood), where it would be recreated, stone by stone, in exactly the same arrangement as before. This reconstruction went as far as to recreate a small stone cist within the circle found during Ritchie’s excavations, although one side of the cist with rock-art was replaced by a replica. The monument therefore was upgraded as well as rebuilt. 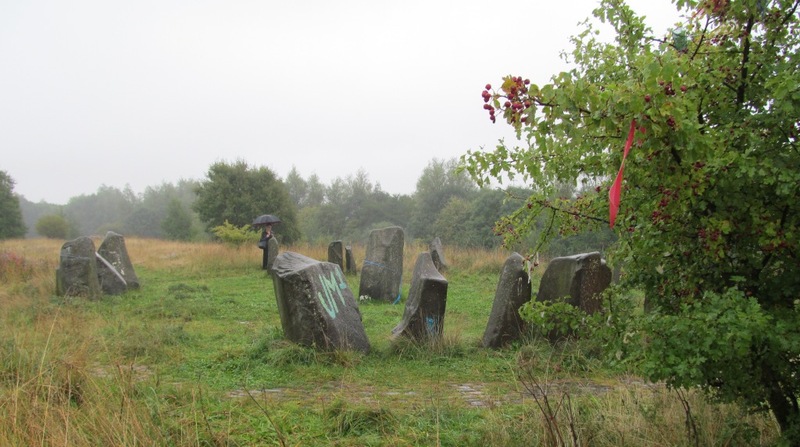 Ritchie believed that the GDC wanted to utilise the tangibility of the standing stones in creating a ‘Glenrothes Stonehenge’, adding time-depth to a newly created community. The stone circle now sits in a quiet little glade, downhill from a relatively new housing estate, away from the bustle of the A92. Beside it are a path and a picnic bench, while a very dirty and beat-up noticeboard informs visitors what this monument once was. But what is it now? And what is it not? Having visited this monument many times, I am convinced that it is a nice circle of stones, but that is it not an ancient monument. Whatever it once was (ceremonial enclosure, burial place) it is no longer. It is not Glenrothes Stonehenge. It is a nice place to walk past, to spend some time in the sun, to reflect on the mysteries of the past. It is a stone circle. But is it out of space, and out of time, and this could be the fate of Sighthill if the mistake is made of simply moving the circle and rebuilding it exactly as it stands just now. If the circle is to succeed wherever it ends up, it needs to be re-invented, not just rebuilt. 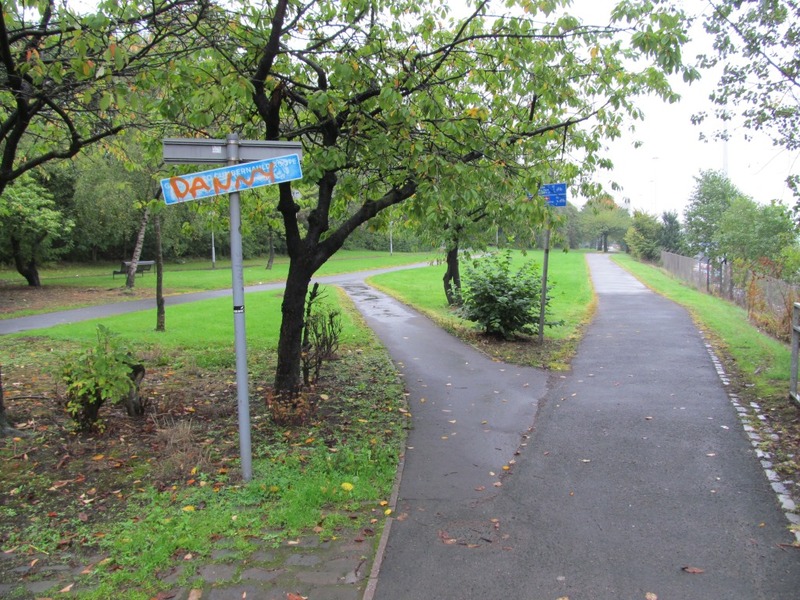 I recently revisited Sighthill with Glasgow University PhD student Helen Green. As with my previous visits, it was raining and miserable, the horizon largely beyond the cloud line. The tower blocks in Sighthill were somewhat denuded since my last visit, although demolition seems to currently be a slow process. Blue strings of plastic that had not been there on my last visit were wrapped around two of the standing stones . The circle is surprisingly accessible from the city centre, about 10 minute walk from Queen Street station, passing through a hinterland of warehouses, car sales garages and student flats in the shadow of the M8, the city centre motorway. Just before getting to the motorway crossing, we reached a short road that must have been shut down by the M8 (North Wallace Street). 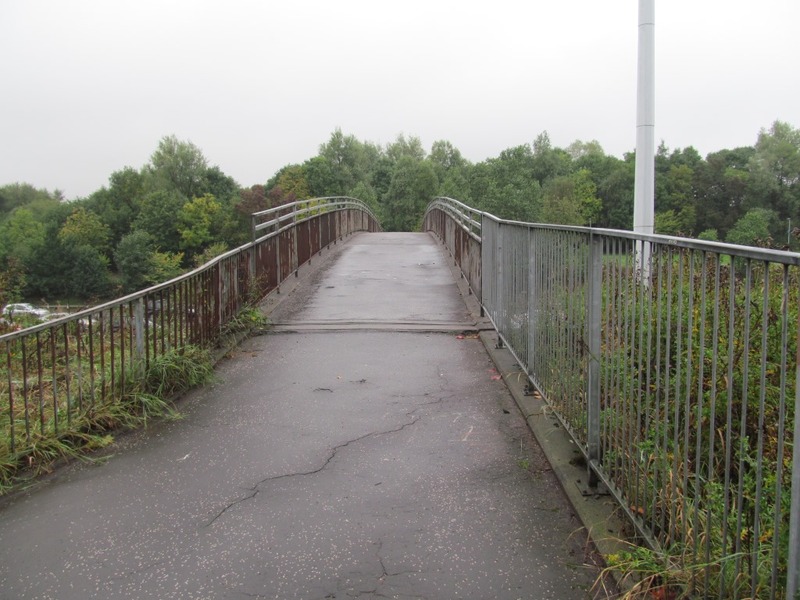 It stopped abruptly at a fence, and from that point, other rusty fences in unusual arrangements and paint-spattered tarmac act as a guide for the walker up towards the bridge, where one moves from city centre to suburb by crossing the chaotic liminality of the motorway below. On the other side, no signs point the way to the Sighthill stone circle. (Nor does it appear on the big information maps on monoliths that we passed en route.) Instead, one is faced with a jumble of pathways and an overgrown slope ahead. This raised area was built up to make this park in the 1970s and then grassed over and planted with shrubs and trees. 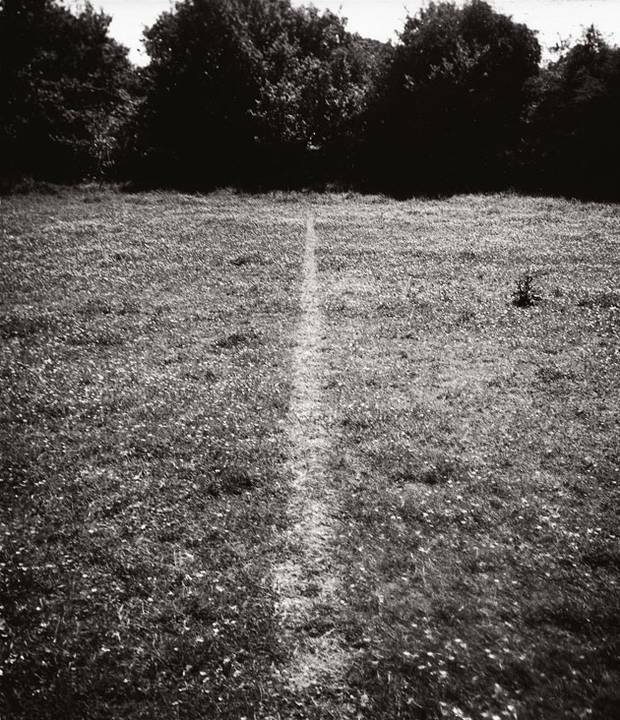 To get to the circle from this point, one has to navigate around the side and up onto this built up plateau, and then depart from the formal pathways to cross to the circle, via paths worn into the ground, reminiscent of Richard Long’s wonderful image A path made by walking. These paths are evidence of habitual movement to and from the stone circle, and will all be destroyed in the redevelopment of this location; none are recorded on maps. These are grassy paths, and to reach the monument, we had to get our feet wet. There is nothing especially easy about this journey once on the north side of the motorway, no concessions to accessibility or convenience. The circle is officially and categorically ignored. The recent round of publicity about the stone circle stems for the aforementioned decision to remove the circle from this location as the radical transformation of Sighthill-on-M8 intensifies. Duncan Lunan has been blogging about the fate of the circle, doing media interviews and – I assume – been in talks with the council about ‘what next’. The stone circle has even featured in the Sydney Morning Herald, with (it has to be said) some assistance from me. And the Sighthill re-development is discussed in more depth in an article in the current edition of Urban Realm magazine, with the stone circle adorning the wonderful cover. 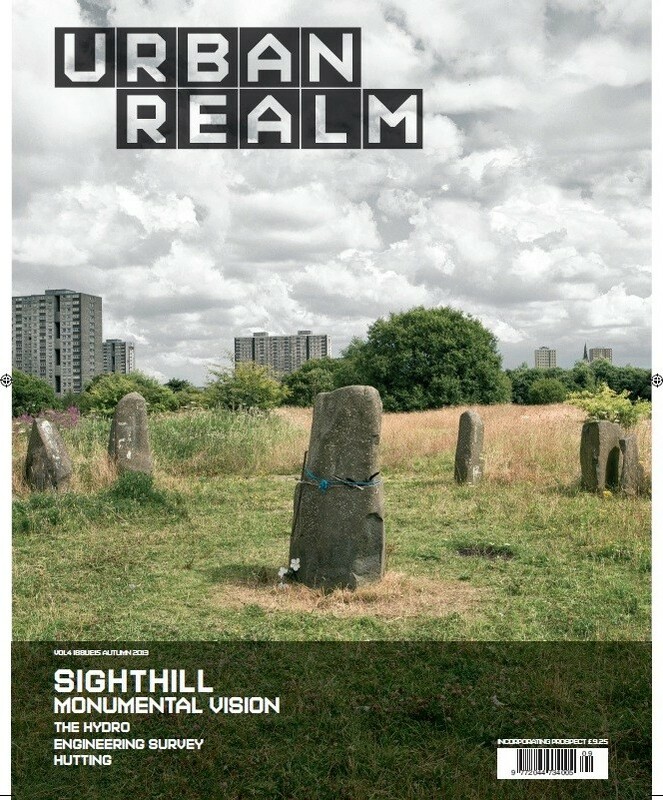 The pun used in this magazine – Monumental Vision – applies to the vision of the architects and others working on the new Sighthill, but I think it also should remind us that the Sighthill stone circle needs a monumental vision as well. 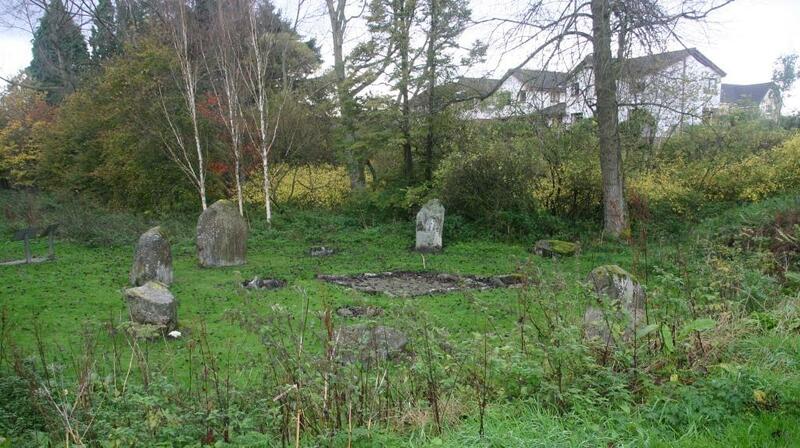 Modern stone circles are ambiguous places rich in irony. The Aotearoa Stonehenge started life as a device to bring astronomy to the masses, but is now used for pagan ceremonies and as a novelty tourist attraction. 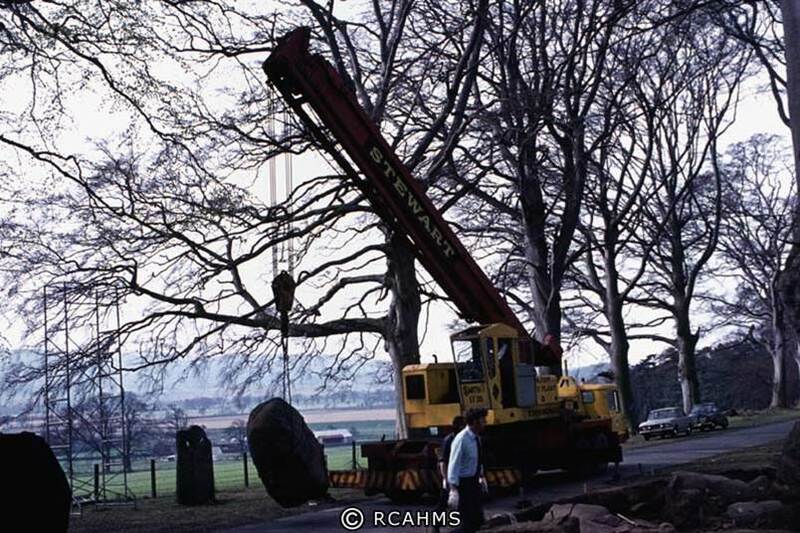 The Balbirnie stone circle need not have moved, because in the end the A92 was built to the west of where this monument originally stood. 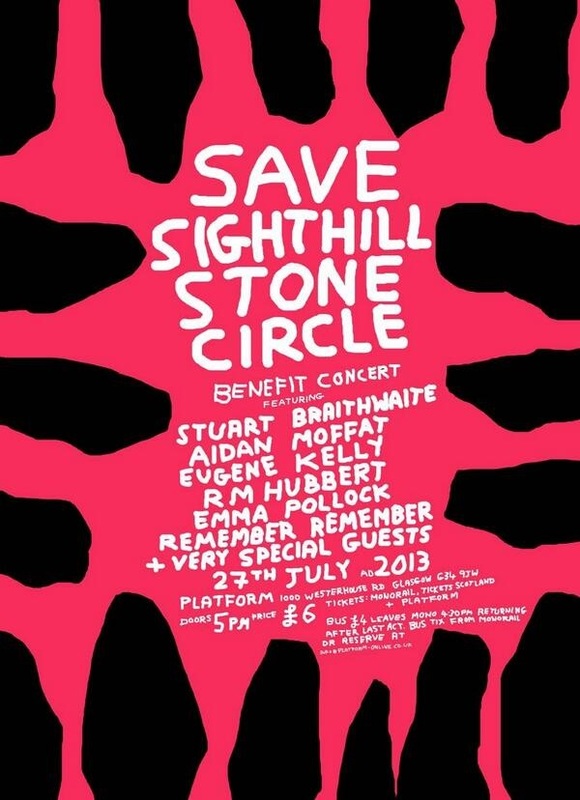 And the Sighthill stone circle is a monument that was built to promote sight on a fake hill. What will happen next to these stones, erected to allow people to appreciate not the gods, but the sun and moon and stars? What now for this crude device, this once forgotten monument that has now been remembered just in time? 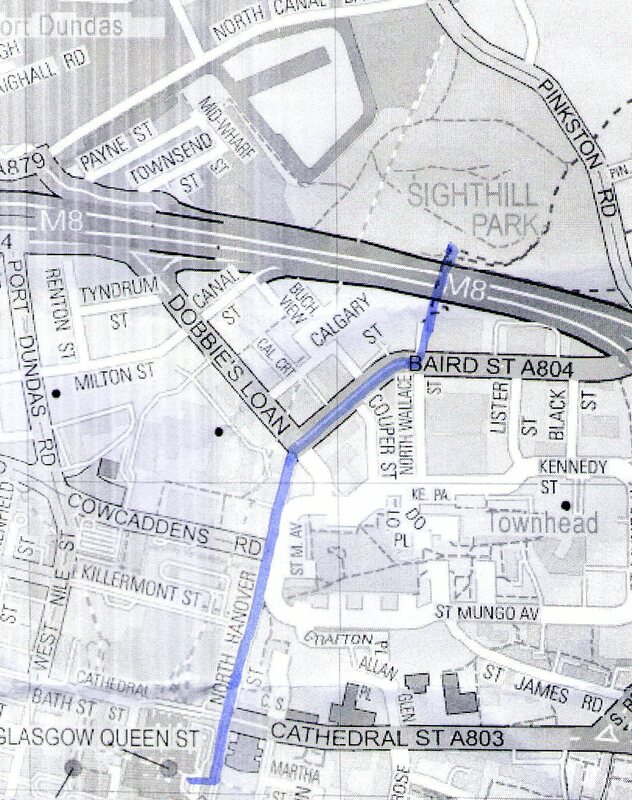 When will Sighthill development cause dismantlement? What next for these heathen stones? Sources and acknowledgements: thanks to Helen for helping shape my thoughts about the future of Sighthill. The discussion of Stonehenge Aotearoa comes from a paper I gave at the EAA Conference in Plzen last month (Something henge: an archaeology of Stonehenge replicas) which was jointly written with Glasgow University PhD student Rebecca Younger. 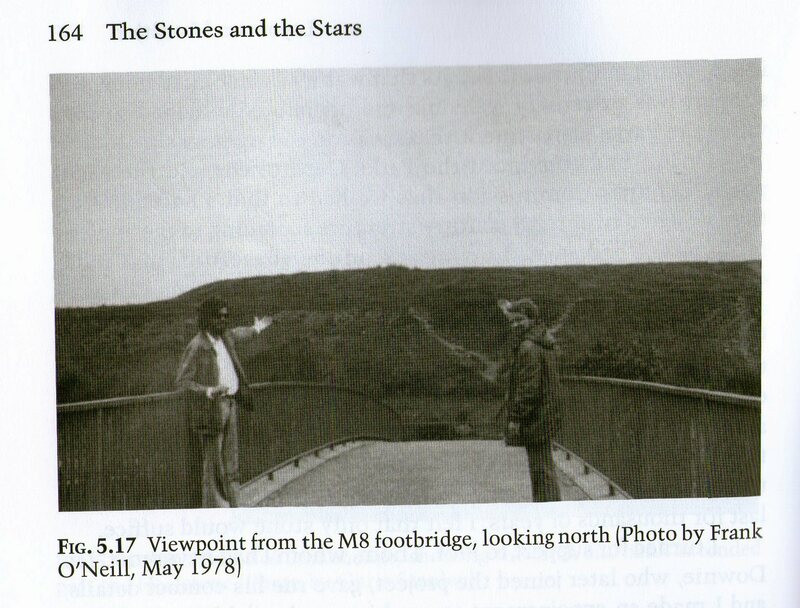 I made use of Duncan Lunan’s book The stones and the stars, and his website (link in blog post) for much of the background information on Sighthill; I have also used the bridge photo from his book, and am grateful for his permission to use his images. 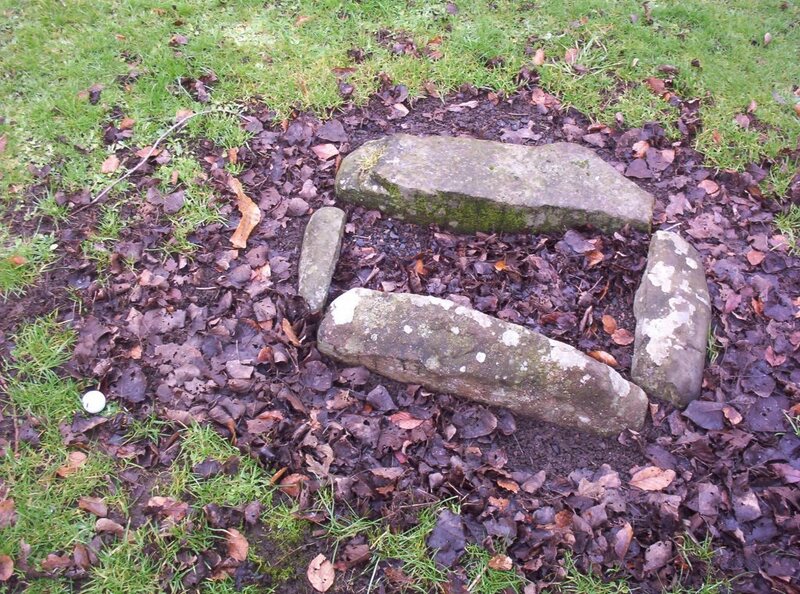 The Balbirnie photos are both from the National Monuments Record of Scotland, and the anecdotal information about the story of this stone circle in part came from the writings of the late Graham Ritchie, or in conversations I had with him many years ago. The Urban Realm cover was sourced from the webpage for this magazine (link in text of the blog) and this website has also been a useful source of information about the development of Sighthill. Much of the Stonehenge Aotearoa background comes from the excellent booklet Stonehenge Aotearoa The Complete Guide, by Richard Hall, Kay Leather, Geoff Dobson and Robert Adam (Awa Press). A line made by walking is widely available online, and the benefit gig poster is also widely available, and was designed by David Shrigley.